Pro-Brexit campaign group Fishing For Leave joined former UKIP leader Nigel Farage’s March to Leave demonstration in the north east of England last weekend. A flotilla of fishing vessels sailed down the River Tyne with banners on the side of the boats emblazoned with “Save our country- No deal now” and “No deal- No problem”. 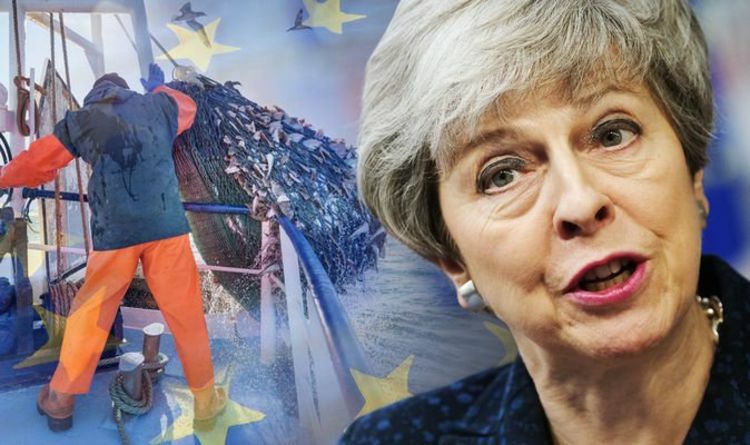 They say the UK leaving the European Union will help Britain regain 70 percent of the UK’s fisheries resources and build a multi-billion pound industry for the nation, similar to other countries outside the EU including Norway, Iceland and Faroe. But the group said they had taken part in the march to share their distain over Prime Minister Theresa May’s Brexit deal, which has been rejected twice by the Commons, as they called it a “death sentence” for the fishing industry. The group said: “Brexit provides one golden opportunity to automatically repatriate all our waters and resources, worth £6-8 billion to national control and to start new policy to rejuvenate our industry and coastal communities. “Pitifully, our MPs have spent all the energy that could have been used to seize such an opportunity on trying to thwart Brexit and our instruction to leave in collusion with the EU. “The withdrawal agreement will become an internationally binding treaty from which we can never escape as outlined by the Government’s Attorney General. “Under the terms of the withdrawal agreement the Government has agreed to re-obey all EU law post-Brexit for a two to four year transition. Mrs May has been trying to convince EU leaders to delay Brexit by agreeing to an extension of Article 50, after being unable to get her withdarawl agreement approved by MPs. The withdrawal agreement, which was first revealed by Mrs May in November last year, said the EU would apply tariffs on fish until a separate agreement was struck on access to EU fishing in UK waters. The EU has repeatedly said that it would only allow British seafood exporters tariff- and quota-free access to EU markets in return for an agreement that EU fishing fleets can continue to operate in British waters. Fishing for Leave argued the withdrawal agreement will “trap” the UK into EU rules and delaying it until later in the year will not improve the situation facing the UK fisheries. They said: “If Britain won’t agree to EU demands then the EU can invoke the Backstop – severing Northern Ireland from Britain and trapping Britain as a permanent EU rule taker. But Callum Roberts, professor of Marine Conservation at University of York, says leaving the EU with no deal will be “highly disruptive” to trade. He said to Express.co.uk: “I can’t see how anyone will benefit from a no deal Brexit, even in the fishing industry. “Huge quantities of UK fish are sold to the EU, much of it fresh and highly time sensitive, so a no deal Brexit will be highly disruptive to trade. Fishing for Leave has been contacted for a comment by Express.co.uk.